Daniel Correa had his heart set on a career in journalism ever since middle school and he’s now taking steps to reach his goal. Daniel’s ambition has been to work as a New York Yankees play-by-play broadcaster since the sixth grade. The first time he put that ambition to work was in high school. As a Sachem North High School junior, he enrolled in a broadcast journalism class working for his school radio station, WSHR. In the class, he prepared weekly radio sports talk shows, similar to what he wishes to do in the future. Daniel’s high school experience is being used to further enhance his skills in journalism. He writes for his school newspaper in the Northwind Newspaper Club, as well as for Sachem Patch, in which he addresses issues in the community as well as the latest sports news. He is a member of his school’s Model United Nations Club in which he represents a particular nation and discusses the issues occurring in that country today. 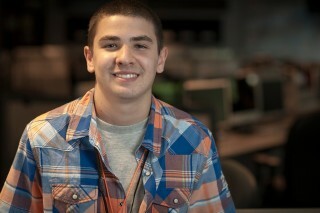 Daniel, an incoming senior, enjoys these activities because he said he takes pride in offering his opinions to others. This spring, he was one of the broadcasters for his high school’s Relay for Life Walkathon. This is an annual event aimed at raising money in order to research the causes of cancer, and is sponsored by the American Cancer Society. Daniel is a fond believer of exposing issues and corruption by speaking his mind. A career in journalism will allow him to propose ideas and make progress towards beneficial change, he said. “A career in journalism allows one to express emotions to those who are unable to speak their mind but are interested in the news,” he said. Daniel’s favorite type of journalism is broadcasting, as he is fairly comfortable speaking in front of people, whether it be a live audience or on the radio with hundreds of listeners. Daniel is a go-getter, as proven by his achievements in journalism up to this point in his life. Whether announcing a game on his school radio station, filming games for the MSG Varsity Club, or writing articles for the newspaper, Daniel is always following his heart and participating in activities which make him happy. “There is no way a career in journalism is not for me,” Daniel said.